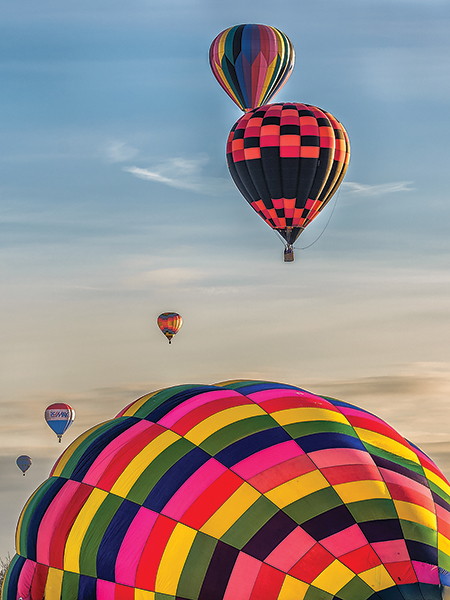 Join us in Hudson, Wisconsin, along the beautiful St. Croix River for Hudson Hot Air Affair, the premier winter ballooning event and winter festival in the Midwest. This family friendly event includes activities such as an evening Torchlight parade, hot air balloon launches, geocaching, marketplace and craft fair, smoosh boarding, 5K fun run, bingo, balloon moon glow or field of fire, just to name a few. Please view the 2019 schedule for a complete list of events and activities on February 1st - 3rd. Due to weather issues of low visibility, fog & mist the Sunday morning balloon launch is CANCELED. A few of the pilots will be on the launch field for a meet and greet, but no balloons will be flying. Due to weather issues this evening's event will be a of Field of Fire. We have pilots arriving and folks are gathering on the field. The pilots will set up baskets and burners to shoot flames into the air. This creates a field of fire that lights the evening sky. We wish the weather was better but Mother Nature rules! Due to the weather conditions there will be no flights this afternoon (Sat. Feb. 2) at the launch field. Some pilots will be there for a meet and greet. On Sat. Feb. 2 The Hudson Hot Air Affair is proud to announce that it looks very, very favorable for the balloon launch at 7:35 a.m. at E P Rock School. Dress warm and bring your camera. We ask for your cooperation at the launch field – No alcohol, No smoking No Drones and only service animals, please. Saturday, January 26, 7 - 10 p.m. at Hudson House Grand Hotel. Enjoy spirits, wine and beer tastings, appetizers and live music. Join the fun at Madison Avenue Wine & Spirits for a pirate themed party. Enjoy Caribbean inspired cocktails, food and live music. MattsRadShow – Hot Air Balloon Launch! From MN: I-94 East, take Exit 1 North towards downtown. At stoplight take a right (East) onto Coulee Road. At the stoplight take a left (North) onto 11th Street. Right (East) onto Summer Street to EP Rock School. From Stillwater: Take St. Croix River crossing bridge to Wisconsin. Take Hwy 35 South to Hudson. Turn left (East) onto Coulee Road. At the stoplight take a left (North) onto 11th Street. Right (East) onto Summer Street to EP Rock School. From WI: I-94 West, take Exit 2 and go North. Turn left (West) onto the frontage road (Coulee Road). At the stoplight take a left (North) onto 11th Street. Right (East) onto Summer Street to EP Rock School.